ADDIS ABABA, Ethiopia, April 13, 2017 (ENS) – Ethiopia’s capital Addis Ababa, a city of at least 3.4 million residents, is poised to build the first bus rapid transit line in east Africa. Construction is currently estimated to start later this year after a planning process that began in 2015. Ethiopia secured a US$50 million loan from the French Development Institute for the project in April 2015. The bureau signed an agreement with the French company, SAFEGE SA, and two local contractors for design and construction of the BRT line in a city where some 60 percent of the populations now walks to their destinations. Construction will begin with the 16 kilometer Wingate–Jemo route. Addis Ababa’s bus operator Sheger Express says rapid buses are expected to arrive at stations every two to three minutes. 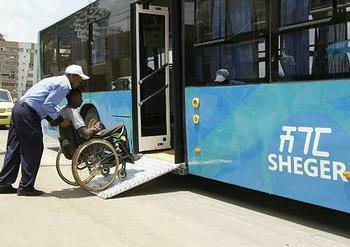 Addis Ababa officials are comfortable with being first on transportation breakthroughs. In 2015, the city launched the first Light Rail Transit in sub-Saharan Africa. Addis Ababa is a member of the C40 Cities Network, a group of 90 of the world’s megacities committed to addressing climate change. C40 recently partnered with the Addis Ababa Road and Transport Bureau to deliver a two-day workshop on measuring the greenhouse gas emission reduction benefits for Addis Ababa’s new Bus Rapid Transit system. A total of 18 representatives from the Addis Ababa Road and Transport Bureau, the Transport Authority, the Institute of Technology and the Environmental Protection Authority learned how to use available data and make assumptions to demonstrate the impact of the BRT’s forecasted operations, construction and manufacturing on emissions, Gifti Nadi, C40 City adviser for Addis Ababa writes on the C40 Blog. As a member of C40 since 2012, Addis Ababa can learn from other C40 cities on BRT design, technology use, integration, branding, public engagement and greenhouse gas measurement. City officials have already visited and taken inspiration from BRT systems in Amman, Jordan; Johannesburg and Tswhane, South Africa; Buenos Aires, Argentina, and New Delhi, India. According to C40’s Deadline 2020 report, <http://www.c40.org/other/deadline_2020>, in emission reduction terms, BRT is the most effective transport program, delivering just over a third of all potential savings from in-city action. 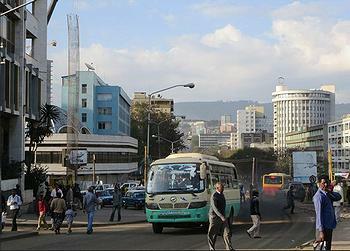 Developing effective ways to transport residents around the Addis Ababa remains a priority for the city government. As a city known for its high pedestrian rate and not for high emissions, writes Nadi, the discussion is centered around controlling rather than reducing future emissions growth. BRT can provide access and relief to pedestrians consisting of more than 60 percent modal share. Unlike other developed cities, the challenge here is not to convince the relatively small number of private car users to switch to BRT. Bigger results are projected from the shift from one type of public transport to another – from minibuses to bus rapid transit. For Dr. Solomon Zegeye, who heads Addis Ababa Road and Transport Bureau, there is more to BRT than engineering and design. “Commuters are interested in knowing that time savings will lead to productivity and a potential increase in income and consumption,” said Zegeye. By the end of the C40 workshop, participants developed three baseline and policy scenarios to estimate the impact on emissions with or without the introduction of BRT. Emission reduction estimates will be documented in a case study that will be shared with other cities undertaking a similar process.